DSM, the global Life Sciences and Materials Sciences company, recently completed a five-year upgrade of its Engineering Plastics facility in Emmen, The Netherlands. The investment, which represents several million euro, includes a capture system that uses waste water from the production plant to reduce emissions to the air of Volatile Organic Compounds (VOCs) to almost zero. 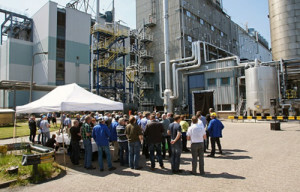 The DSM Engineering Plastics plant in Emmen, which produces high performance polyesters, was acquired by DSM in 2009. Since then, the company has made significant investments in the facility, applied the latest technologies and introduced the most advanced operating systems to continually optimize the production processes – increasing output and making them more sustainable. As a result, the plant’s energy use has decreased by more than 30% – and water consumption has almost halved. The new capture system, also known as a Scrubber, reuses 80% of the water from the production process.